The contribution of the pallets into the style life of the common people is best seen in the variety of the seating items having been built on a large scale and that too in unlimited range of styles and designs. There is a vast range of the chairs and the sofas made from the pallets and one of them is right here with us to be the topic of our today’s post. 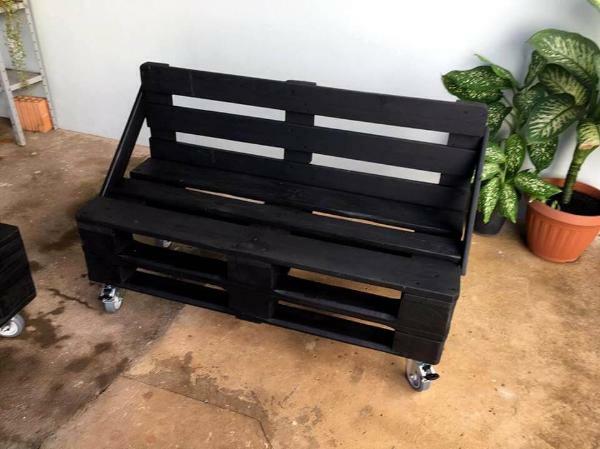 So people just check out this DIY pallet sofa on wheels build to sit comfortable in the porch and living area of the house. The sofa is like all the basic and common type of sofas having a berth seat and a back made from the pallet skids and slats respectively. But still we have managed to give it one unique touch through the angled arms on the both sides and the wheels at the ends. The sofa has been stained in the black for that intense rustic look and the blue, yellow sofa makes it look shabby chic. 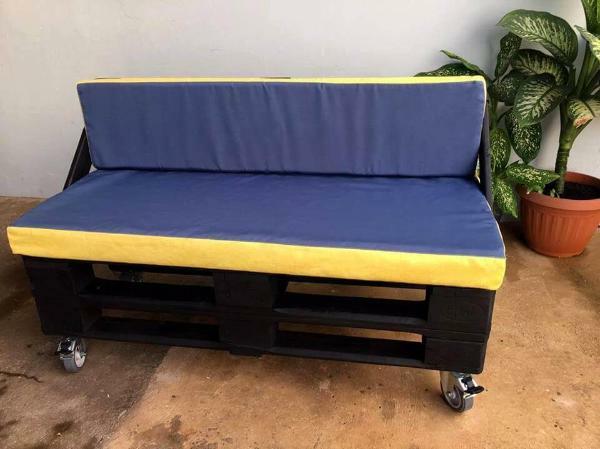 The pallet sofa here in the picture has been made using two pallet double face skids being tiered on each other with a slatted back having very unique angled arms coming from the top of back and ending in the middle of berth seat. 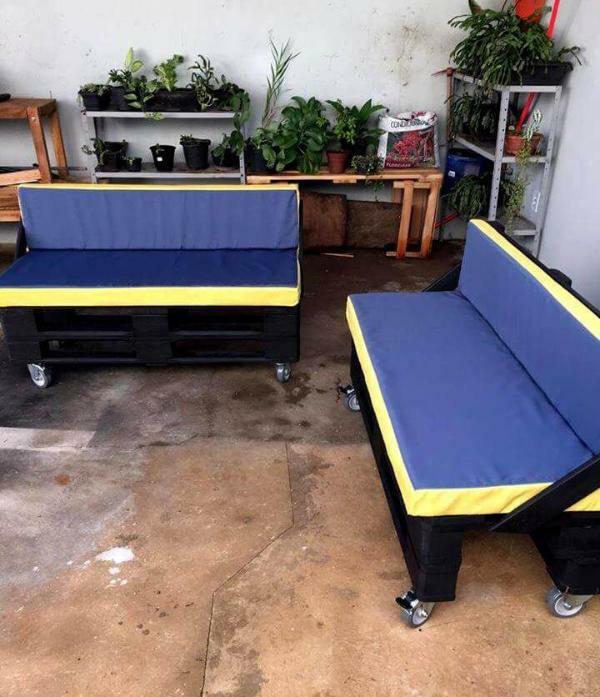 To turn the pallets into the comfort and more stylish seat, it has been provided with a comfy mattress in blue and yellow color which really contrasts well with the black stained, intense looking sofa seat. To make the sofa move easily all around the living spaces and making it easily adjustable, wheels have been added at the feet of the sofas which also lend an industrial look to it. And you can build more more than one sofas according to your needs.